Hair Club Elmwood Park is located behind the Korean church (the Korean church is a white building but not easily identifiable from River Drive). It is a 3-story, tan, professional building with blue-tinted windows with big letters ELLKAY at the top. We are located on the 2nd floor. Turn right when exiting the elevator and we are the 1st set of glass doors on your left. PUBLIC TRANSPORTATION: New Jersey Transit and Mass Transit Bus 160 & 161. Both buses stop on River Drive at the corner of Slater Road. Our building is located behind the Korean church. From Garfield Rail Station: go 1 block south of Midland Avenue. 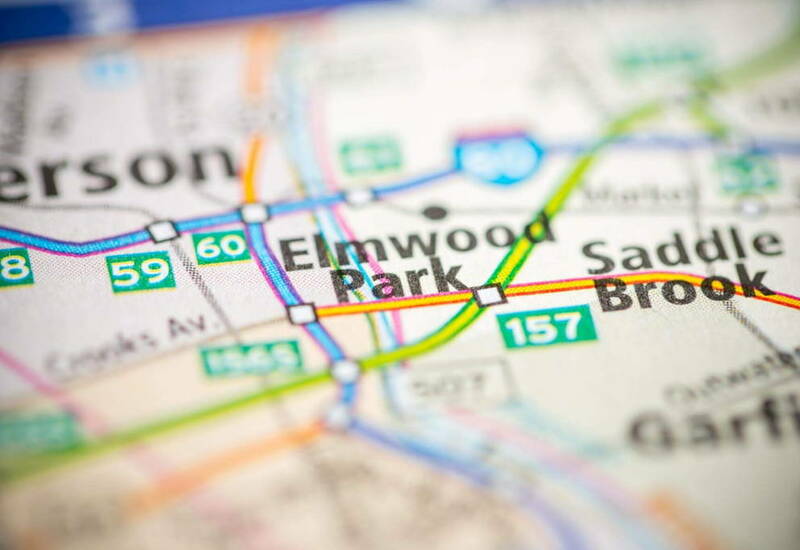 IMPORTANT NOTE: When entering our address into your GPS or MapQuest, please enter 690 River Drive, Elmwood Park, NJ 07407. Saturdays only: our building is locked on Saturday. Please ring the doorbell on the left side of the entrance in order to enter the building. I”m very happy with Alicia, my hairstylist. Alicia is very creative and shows a sincere interest in addressing my needs. It is obvious that she is very cooperative and helpful with the other hairstylists. Alicia is always a pleasure to be around...a real asset to the Elmwood Park Hair Club.. A special thanks to Joanne (keeps everything running smoothly). and all the other hairstylists. I started treatment here at Elmwood Park Hair Club about 7 months ago. On the first day, I saw Anna and she went over the program and what was best for me. I decided to enroll. Claudette is my stylist and she has been amazing. She is very knowledgeable and she always answers all my questions. I have seen good progress so far and I am hoping things will only get better. Customer service provided by Claudette has been great. Two years ago I saw a commercial for the Hair Care for men and women. my hair had been thinning for years and now I could see a bold spot in the front so I gave them a call. I started out with one treatment and they had to switch me to another because the first was not working. I ended up with Claudette, who I spent almost a year with. She was wonderful, always had a smile on her face, listened to you, and a caring person. I loved how she cut and colored my hair. I received several comments on my hair. She was wonderful. Two years ago , I saw an add on TV about Hair Club and i scheduled an appoitment. I met Claudette. Excelent technician, warm and amazing lady. She explained the process and took care of my hair from the very first day. Always with a smile on her face, always ready to help my hair look at the best. I have followed her recomandations and the EXT treatment, and I can see the results: my hair grows and looks great. Thank you Claudette, I come every month with confidence in your hands, knowing that you will do the best for my hair. A Thank you to all the ladies at Elmwood Park location, specially Joann . The moment I step in to their office I felt extremely comfortable and confident in the people and result that I have gain. The staff are some of the nicest people in the world and the results I gain from the products and hair treatments are great. Claudette is such a positive person! She's been doing my treatments for about a year now, and has been making my experience here wonderful, I am glad I joined! I’ve been a client of the Elmwood Park NJ Hair Club location since the fall of 2016 and in just 5 months I've already seen quite a bit of improvement in my hair growth. The products they give you are high quality and easy to use and my once a month full treatment with my terrific stylist Claudette is always something I look forward to. I always leave each treatment feeling great and more confident about my hair. Stop ignoring your hair loss problem and contact the Elmwood Park NJ Hair Club location ASAP. I'm glad I did. The staff is great and they'll definitely be able to help you. I am so satisfied how well my treatment is going so far getting great results. Thanks to my stilyst Claudette who is helping through it. She is the #1 her personality is amazing. Whenever i come to my appointment she puts a smile on me when she gives hope for my hair goals. Her attitude is so positive and makes you feel positivie. Im really sure the hair club is really proud to have such a wonderful and kind person as Claudette. Claudette is an amazing woman, and I love her! She is my stylist for about 2 years and my hair looks healthy and is growing back because of the products. Every one of my needs are met when I see her, from an awesome head massage, to a big warm hug from her. Claudette takes great pride in her expertise and always gives me great hair tips. I look forward to my visits knowing I will be in her company for a while.I always leave happy :) ....and I will brush my hair everyday!!! I would like to thank my stylist Claudette for helping me with my hair. Her personality and advice made my visit’s something I looked forward to. She is a true professional, a warm and caring person. I feel fortunate to have had Claudette as my stylist. Thank you Claudette for your support. My ,hair improved very much since participating in Hair Club.Thanks to Claudette which she is very professional in her duties and very friendly. Thank you very much Claudette, for everything. My hair improved very much since participating in Hair Club. I'm very thankful with CLAUDETTE, which she is very professional in her duties and very friendly also. Thank you very much Claudette. I want to say thanks to my stylist, Claudette she has been helpful and very professional in her duties at hairclub. today ends a year long treatment towards regaining my hair back. I can proudly say I dont have my hair falling anymore like it use to. Thanks once again to Claudette and hairclub group. Been very helpful. Claudette was a real delight and I felt at ease and very confident in her knowledge and skills. My hair improved a great deal since participating in Hair Club. My experience at hair club was wonderful. I would rate this 6 stars. The ladies take care of their clients &amp; make sure they leave happy &amp; satified. Very professional. My hair stylist Claudette was the best. Treated me like her own child. Great place, highly recommend. My experience was wonderful. Very professional. I would rate this 6 stars. My beautician Claudette was extremely marvelous &amp; delightful. She treated me like i was her own child. I highly recommend. I've been a member of Hair Club for almost a year and a half now. My 2 favorite people are Britnee and Claudette. Both have excellent customer service. Claudette is very professional and courteous, I always enjoy my visit and looking forward for the nice conversation I'll have. Time passes so quickly every time I visit. I don't see Britnee a lot but it is always a pleasure every time she takes care of my hair. Thank you both. I have been getting my ext. treatments from Claudette and I must say she has educated me about everything she does,she is pleasant,kind and gentle.There is no doubt she knows her stuff.Anyone out there experiencing hair loss in the Elmwood park region check out hair club and ask for Claudette.She made a believer out of me. I have had my treatments with Claudette for a year now. She is a world class stylish and lady. Very happy with the progress and the services provided to me. I was so depressed when I started to loose my hair in 2012, I didn't have any confidence, life, self esteem, or been proud of myself; so I started to llok for someone to help me or give me some kind of guidances, so I turned to hair club, it was the best decision I ever made; I started in Feb 2014 and by the summer I had at least 75% of my hair back; I've always had thin hair but comparing it to theway it was before it was a HUGE diffference. I had Samatha from East Brunswick at first she was excellent gave me a lot of confidences and boost my spirits up. Then unfortunately, my father-in-law was diagnose with cancer so it was a draw back where I gain started to loose my hair, I couldn't go back &amp; forth to East Brunswick so I found the one in Elmwood Park, NJ this is where I met Claudette, she was an inspiration to me with what I was going through, then to amke matters worst my mom has gotten worst; these guys are not just there to make a buck but, theu also give you so much confidences, and help you in every way they can, they help you get through every little obstacle and I'm so very grateful. THANK you for allthe support, inspiration and the ability to help me restore most of my hair back. The staff in Elmwood Park (at least the ones I met) are such warm and positive people. They greet you with such a welcome that one would think they believe you are a very wealthy relative who is going to leave them a fortune. Now I come to my two favorite people - Britnee and Claudette. Britnee must meet many so people and yet she remembers each one, what they do, their family, their work. And she is always bursting with encouragement, helping me when I'm feeling discouraged, so positive. She believes that Hair Club can do anything with regards to hair and you start believing it too. (I was having trouble with my hair because it was so fine and the X-Strand wouldn't stay in.) But she believes that Hair Club has a solution for everything so that I am confident in the end that I will come out with my hair looking much much better. Which brings me to Claudette. She is so cheerful that when she opens the door to come in, it seems as though she brings the sun in with her. She has been working on me, trying to whip my hair into shape so that the X-Strands will stay in. I so enjoy seeing her that I don't care if I even have a treatment. Plus she is an excellent stylist and colorist, getting me back to a shade and a style that I thought was long gone. I hope I can continue using her magical services after I am no longer an active Hair Club member. My only quibble is that I wasn't advised when I started that Hair Club also does one's coloring and cutting so I had to wait six months before I could benefit from the full range of Claudette's services. If I knew someone who needed your type of service I would definitely recommend these folks. I have been a client since May and have had a wonderful experience. I get xtrands and just love how they give my hair so much fullness. Maria does my xtrands and is awesome and Claudette does my color and she is fantastic. All the employees there are very friendly and professional. I have so much confidence now that my hair is fuller, i am not self conscious about my hair anymore. I would recommend hair club to anyone who has thinning hair. I write this review with great pleasure. From the moment I met with Melissa Burtts, I felt better about looking at my options. She explained the entire process and I never felt pressure to move forward. She is professional and knows what she is talking about. I decided to go for the procedure and together we picked out the amount I would need. Melissa was able to get me scheduled at Bosley the very next week. I arrived in NYC early in the morning to begin the process. I met with Dr. Mollura who explained to me what to expect. I found him to be very straight forward and honest. His team did a fantastic job and I was back home in NJ that night at 6:00 PM. I was told what to expect, and it was all dead on. I would rather someone tell me the truth (such as it may be a bit uncomfortable at first) vs. "Oh, it is nothing". It really was nothing, just a bit uncomfortable, as I was told. Folow up has been great, back the next week to see the Dr. in NYC and my stiches were removed. Again, he answered all of my questions. (And I always have many) After my first month, I was fortunate to meet two more superstars, Britnee Hughes (Another advisor) and Claudette (she does my treatments as well as my hair cuts) Brittnee looks at my head on the computer and is very always positive and informative. Claudette is always a pleasure to spend time with. She is friendly and down to earth. She tells it like it is, and I like that! So as I write this (on my two month anniversay) I can honestly say people have complimented me on my hair. I know, at this point, it is mostly due to the products and the "Space Helmet" that makes me look like "Gazoo" from the "Flintstones". Today, Brittnee showed me the start of the new growth on the computer. That made me feel good! I know this is a long process, however I know it will work as promised. To close, Melissa, was so kind that after the procedure she even called me at home to see if I had any questions. My only question was "When am I going to see my hair growing?" her reply was "patience grasshopper, it will grow" All the people, including Jo Ann at the front desk have been, and I quote Brittnee, "The Bomb Dot Com". I am 47 years old and wish I had done this sooner, I say "GO FOR IT". Sincerely, Grasshopper. The products are good. They work for me, I have no problem with them. I have been coming to hair club since March and this was the best decision I could have ever made. I now feel so much more confident and have seen such amazing results doing the EXT treatments and now I've switched over to Xtrands which is amazing!! Claudette is the best. She is so welcoming and caring and truly looks out for you. She gives great advice and helps you gain your confidence. I truly recommend this location to anyone out there who suffers from the devastating effects of hair loss. And especially recommend Claudette! I have been a member of hair club since March of 2014 and it has been such an amazing experience for me. All of the women at Elmwood Park are so warm, compassionate and welcoming! Especially, Claudette who is AMAZING. She has guided me through the process and I have seen such amazing results with the EXT treatments. My family and friends all notice the difference and my hair is finally growing and getting longer. And now I'm about to start the new and exiting Xtrands treatments which I know is going to change my life and my confidence even more! I genuinely recommend this place to anyone who struggles with hair loss problems. It has changed my life!! I have been a member for four months. I love Claudette from day one she gave me confidence and a lot of hope that the treatment is going to work. Claudette is right I see it, I have new hair growing. Claudette is very concerned about her clients, she is so sweet and friendly. I'm proud that Claudette is my hair caretaker. I want to get the hair transplants and I am saving up the money to do so. Claudette has been a pleasure to work with. She has a sweet and upbeat personality and is always looking for ways to help. I am so glad I am able to work with her in dealing with my thinning hair. My consultant, Rosa Fernandez was extremely friendly and helpful! Claudette, is the best. She is always concerned with how my treatments are going and what she can do to help me succeed with my thinning hair. It is a pleasure to go and be treated by a highly professional technician and staff. Alvin H.
Claudette is such a great person. She is always pleasant and makes the experience enjoyable. All the staff at the Elmwood Park location are friendly and pleasant. I have had good results and am happy that I did this for myself. thank you Claudette for working with me. The people there were really friendly and happy. Always ready to help and I thought they put 100% of themselves into their work. Wayne Glenn rating for Claudette A1 for may opion. the whole staff good service. thank you for the heads up. Elmwood Park whats up. Everything was good. It was pleasant and they take care of you. This was my first time getting help with my thinning hair. Claudette, my "hair caretaker" was wonderful. She made me feel relaxed and comfortable. She explained the whole process and I see positive results. She has a warmness and professionalism about her that I really appreciated. Hair Club staff is wonderful. Great staff on the front line and the new customer relations person communicates well and has a great personality. Eileen Perry, my stylist at the Elwood Park center, is an absolute star. She is both talented and conscientious, I am happy to report. I would like to thank my technician Claudette for being very professional and understanding. I have enjoyed my treatments with her very much. Thank you very much Claudette. What a wonderful person I have found at hair club, this lady is amazing she has been taking care of me since the day I decide I need to do something for my hairy lost, every month she made me smile and giving hope about my hair goals. Last time she showed me some pics from the very begging when I started and now how my hair is getting better and better I cried and she was about to cry too because she understand how people like me we feel like about losing our hair. Claudette thank you so much for your help and support !!!!!! I'm sure the hair club is very proud to have you working for them! Cause I am proud to have you helping me! Certainly, I'm a Happy customer Hair Club has proven to me that there products really do work,They have done an amazing job in restoring my hair to its natural beauty Thank you to all your warm,friendly staff,especially my wonderful experience stylist who is professionally trained, Miss Claudette,she gives me a massage out of this world, you are the best xo. As a longtime satisfied client, I can truly say there is no one else in the industry who does it better than Hairclub. From their cutting edge technology which is always improving to their experienced stylists and friendly staff, they are always there when I need them. Halmwood Parkir Club in E. I have.have been a client of the Elmwood Park branch of hairclub for only eight months. i have been extremely pleased with the professionalism associated with the technicians and management. Alicia, my technician, is very knowledgeable and talented and makes me feel very comfortable. -BARBARA D.
I've been a member of this club for over a year and I am very please with the service and expertise of my stylist - Francisca. She takes proud in her work, and is very caring and considerate. I had a little problem in the beginning, but Francisca made sure it was corrected, and all of my needs were met. HC is very lucky to have her. She provides the Ultimate Customer Service all the time, no matter whats the problem, she's always willing to help, make you look good and feel your best. In addition, Joan and Abby at the front desk have being very nice and accommodating, by making sure my appointments are scheduled according to my availability. -E.B. Great service,little waiting time and great people..
overall i'm satisfied with hair club's service. i've been a member for two years and i've never had any issues with the products, service or staff. I loved my hair style done by Dulce. Her gentle touch and accommodating spirit is refreshing and comforting. Abbey is great too, she along with Joanne helped me secure appointments for the summer that were convenient for my schedule. Eileen's willingness to please helped me out twice in emergencies. Eileen and Donna are always there to come to the rescue when things arent going smooth enough. They are very well trained and excellent hair stylists. I look forward to seeing everyone I just love everyone here. Thanks to all ! -Dee M.
I have been a member of Hair Club for over 10 years. The staff, from front to back is accommodating and helpful. My stylist, Dulce, always comes through with skill and professionalism. -Jerry M.
Hair Club for Excellence. I have been a member for 10 Years plus. They staff has always been very professional and understanding. My stylist, Donna is outstanding. She is a true professional and knows her stuff. As far as I'm concerned she is number one. The offices and location are clean and easy to get to. This has really changed my look and confidence in myself.